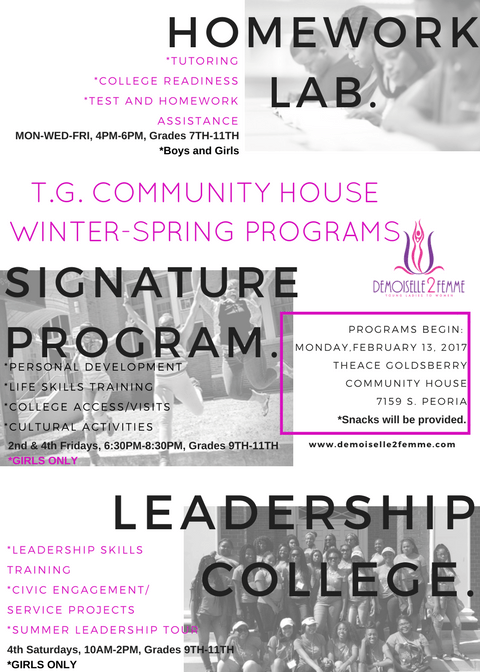 Beginning Monday, February 13, 2017 the T.G. Community House will be offering free and low-cost programming for 7th-11th graders through a “Homework Lab” complete with free wifi, homework assistance, test-prep, and high school or college and career exploration for youth of all genders, as well as programs targeting young ladies through a “Leadership College” and a more holistic Signature Program that provides social-emotional learning curriculum and more. Englewood’s very own safe space and sanctuary welcomes you to join us to learn more about programs and opportunities at the Theace Goldsberry Community House , 7159 South Peoria Street, Chicago, IL 60621. For more information, contact our Community Engagement Specialist, Cosette Hampton at champton@demoiselle2femme.org.